You are questioning the rationale behind virtual cocktails made by virtual robots? Well once upon a time people thought making real robots mix drinks was crazy. Hello?! 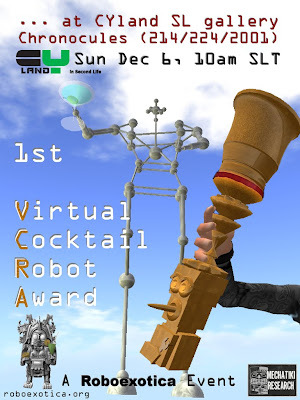 In any case we are showing our appreciation for cocktail robots in their virtual incarnation by awarding the first Virtual Cocktail Robot Award this year in an inworld ceremony in Second Life (TM), that will be part of the ACRA event at Roboexotica which will be video-streamed into SL. Join us either in real life in Vienna, or if you prefer at the virtual venue which is hosted by our friends of CYlandSL.